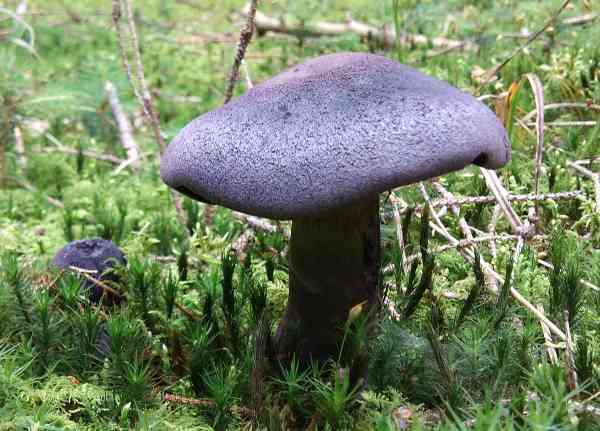 Cortinarius violaceus is entirely violet, purple or blue (sometimes so dark that it appears to be black and, viewed from above, can easily be mistaken for a blackened dead leaf). At up to 12cm in cap diameter, this is a very striking mushroom indeed. It always comes as a great surprise to people who are not 'in to fungi' that mushrooms come in as many colours as do flowers. Blue and violet fungi come more as a shock than a mere surprise! The lovely specimens shown above were photographed in central-southern France, in early October and were fruiting in small groups beneath pine trees but with silver birch trees nearby, making it impossible to determine in the field whether the fugi were mycorrhizally associated with one or other or indeed both of these tree species; however, in the detailed identification guide below you will see a photomicrograph of its spores, which are ellipsoidal, a characteristic of Violet Webcaps that are mycorrhizal with conifers. In Britain and Ireland, where it is a very rare find, the Violet Cortinarius grows in limestone and chalk-rich woodland habitats mainly under Beeches and other broadleaf trees but also very occasionally with conifers. This is a mushroom of late summer and autumn. 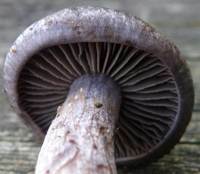 Described scientifically in 1755 by Carl Linnaeus, who called it Agaricus violaceus, the Violet Webcap was transferred to the genus Cortinarius in 1821 by the British mycologist Samuel Frederick Gray (1766 - 1828). 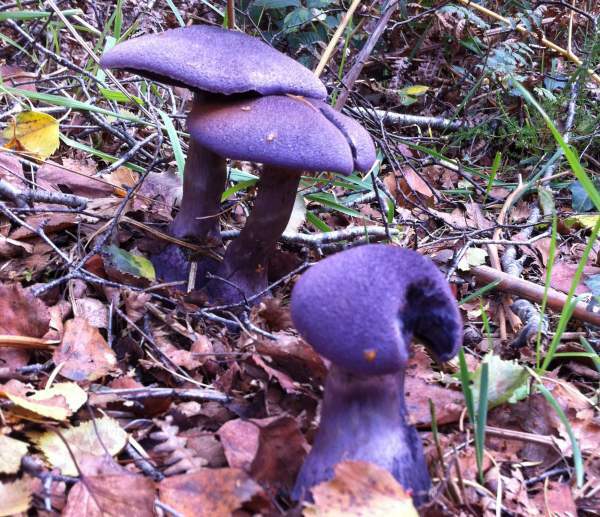 Cortinarius violaceus is the type species of the genus Cortinarius, which is the largest of the mushroom genera. Being violet, this webcap's colour is far from typical, as the majority of webcap species have fawn, orange or brown colouring. There are, however, other 'blue' webcaps including for example Cortinarius caerulescens. It hardly needs mentioning that the common name Violet Webcap comes from the colour of every part of this mushroom plus its web-like partial veil, or cortina, that spans the gap between stem and cap edge, thus covering the ripening fertile surfaces (the gills) of the mushroom. Similarly, the specific epithet violaceus is a direct reference to the colour of these beautiful mushrooms. At first hemispherical and later expanded with a slight umbo but often retaining an inrolled margin, the caps of this rare species are deep purple when young. The cap diameter of Cortinarius violaceus ranges from 6 to 12cm at maturity. The adnate gills of the Violet Webcap are moderately spaced and purple when young. 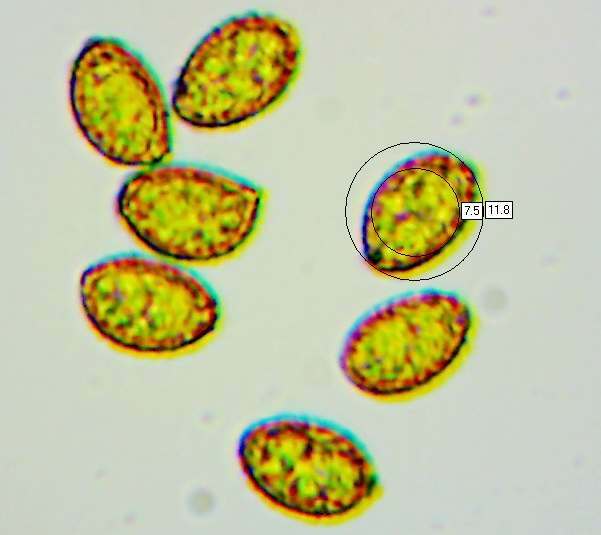 As the spores mature, the gills turn rusty brown and eventually they are stained dark by the spores. The stipe or stem of the Violet Webcap is purple and fibrous with a slightly clavate (club-shaped) base. Typically 1 to 2cm in diameter, it can measure as much as 3 or 4cm across the base. The stem flesh - left - is also purple. 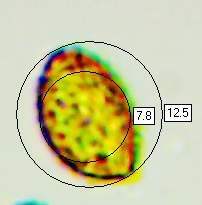 Ellipsoidal to amygdaliform (shaped like an almond), 11.5-14.5 x 7-9μm; thick-walled;somewhat ventricose (slightly swollen on one side); inamyloid. 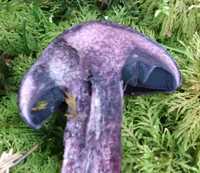 The cut flesh of Cortinarius violaceus smells slightly of cedarwood; it has no significant taste. This mycorrhizal mushroom is found in deciduous woodland and occasionally under conifers in alkaline (chalk and limestone) areas. July to November in Britain, usually fruiting earliest at higher altitudes. Cortinarius violaceus is rare in Britain and Ireland but rather more common in some parts of mainland Europe, Asia, the Americas and in New Zealand and Australia. Distribution tends to be localised, and fruitbodies occur either singly or (more often) in small groups. 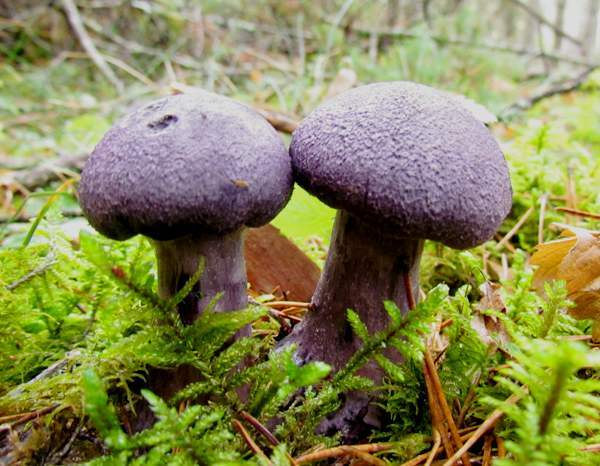 Although many authorities state that the Violet Webcap, Cortinarius violaceus, is a good edible mushroom, there are at least two sound reasons for not gathering this species. The first is its rarity: many seasoned forayers with decades of fungi hunting behind them have never seen this beautiful mushroom, and so unless a sample is required for detailed study its seems wrong to remove any from their natural habitat. This page includes pictures kindly contributed by Lindsey Beasley and Jochen Dahle.